For the first time the emblematic Traveller Large Date, Moon Phases & GMT watch features a transparent dial. Available in either classy stainless steel or an elegant pink gold version, this new Traveller model displays both a strong character and high degree of sophistication. 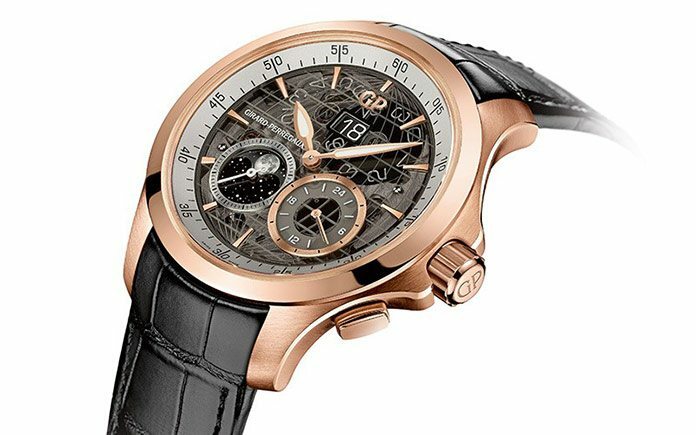 A watch of great technical efficiency, its case houses an automatic mechanical movement manufactured in-house by Girard-Perregaux and notably offering large date, second time zone, moon phase and small second functions. This latest creation from Girard-Perregaux features three watch complications housed in a case with contemporary dimensions and a 44 mm diameter, and available in either stainless steel or pink gold. For the first time in the Traveller collection, the metallic gray sapphire dial subtly reveals its finest display at 12 o’clock, in the form of the large date mechanism. This mechanism is the subject of an exclusive Girard-Perregaux patent. it is a sophisticated device made up of two superimposed disks incorporated into the GP03300 automatic caliber. The juxtaposition of the disks, one of which has pieces made of transparent folanorm with a thickness of only 0.10 mm, ensures an aesthetically perfect display in which there is no visible separation between the two disks. The most outstanding of these complications, the moon phase indication, is both realistic and extremely poetic, and is perfectly represented by an impressive metallic treatment. a further subtle detail of this model is that the moon phase indication is directly attached to the barrel, thus allowing for a very high degree of accuracy. Adjusted by a corrector button situated at 8 o’clock, it is surrounded by a circular satin-brushed ring and features a small second hand at its center. The most observant may note that the Milky Way even mischievously conceals the brand’s logo with one of its stars! Positioned between 4 and 5 o’clock, the information about the second time zone is cleverly merged with the moon phase indicator. The timepiece’s highly accurate dial clearly fulfills its role as a subliminal invitation to travel. The influence of the meridians highlights its impressive volume. While the lines of the earth’s parallels merge into the sapphire crystal, the beveled applied hour-markers give an added richness of detail and interplay of light. Water-resistant at up to ten atmospheres (or a depth of approx. 100 meters), the satin-brushed and polished case in steel or 18K pink gold with a 44 mm diameter and a thickness of 12.10 mm protects from external contact a GP 03300-0109 automatic manufacture caliber. Visible through the transparent case-back, the automatic movement measuring 131⁄2 lignes (equivalent to a diameter of 30.40 mm) reveals an oscillating weight inspired by the shape of the Girard-Perregaux tourbillon bridge. With 35 jewels and a 46-hour power reserve, this magnificent mechanism has a frequency of 28,800 vibrations per hour for maximum accuracy. To make the Traveller Large Date, Moon Phases & GMT watch as comfortable as possible for the wearer, every last detail has been attended to, from the curve of the case band to the alignment of the screwed-down crown. Fitted with ample lugs, its comfort and fine design make this model very attractive. available with an alligator skin strap, this new model is attached to the wrist by a folding clasp that is a perfect combination of elegance and sportiness.